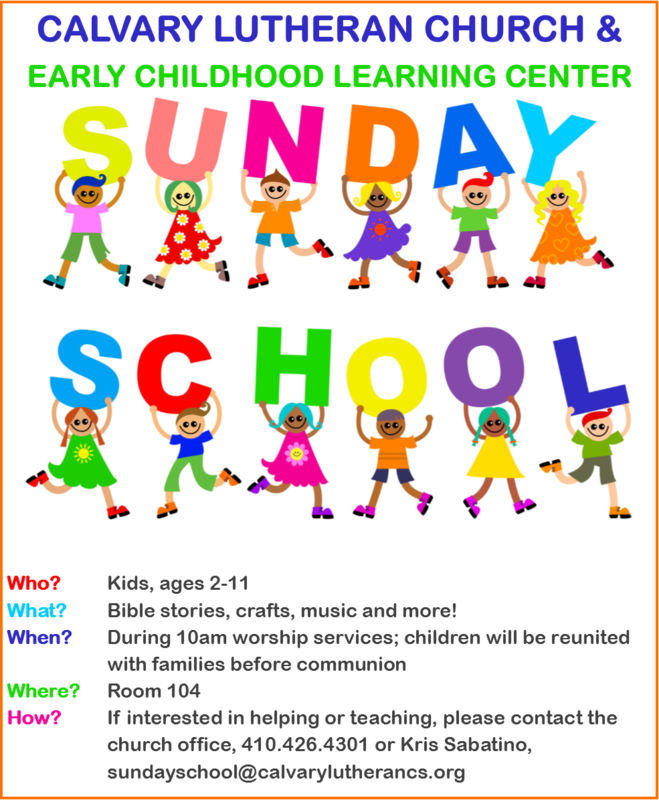 Click here for more information on Calvary's Early Childhood Learning Center Program. As Calvary and the community partners with CECLC to minister to children and their families, we would like you to consider several volunteer opportunities. Please carefully pray where God may be able to put your time and talents to use - we would love to work with you! Daily Volunteers: Greeters - to be at the door to welcome children and parents from 8-8:30am. Flag Monitors - raise and lower the flag at appropriate times during the day and be aware of times when the flag should be flown at half mast. Aunties & Uncles - sit with children, comfort them, read them stories, assist during rest time, help redirect children to make better choices during learning time, and generally assist teachers in the classroom. Weekly Volunteers: Art, Music, Physical Education, Library & Computer Volunteer Instructors or Helpers - classes will be held once a week. The volunteer instructor would be responsible for planning and implementing simple lessons. Classroom teachers or instructional aides will stay with their classes to provide discipline and support the volunteer instructors. These positions will require a time commitment of about two hours on site and whatever planning will be needed. The volunteer helper would assist with the weekly art, music, physical education, library & computer classes. Contact Ms. Jamea Christian at the center, 410.426.4302, for more information or to sign-up. She looks forward to speaking with you! Wednesday, 7pm, Library/Music Room; the choir sings regularly on Sundays and for special services; no rehearsal during the summer. Calvary is always looking for individuals interested in participating in contemporary worship, leading services featuring contemporary Christian music using vocals, guitars, keyboard and drums. You have an open invitation to share your time and talents with us during worship services. We are always looking for vocalists and musicians to share the Word of God through music.